The 50 BMG represents the maximum in small arms performance. 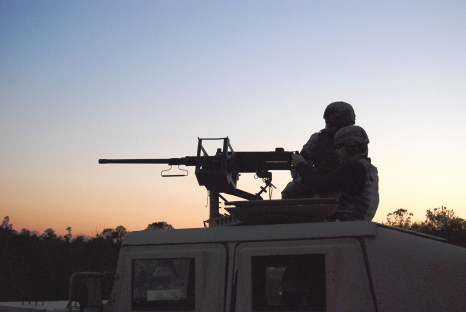 A M2 Heavy Machinegun will propel a 668gr bullet to 2910 ft/sec at the muzzle. This corresponds to a kinetic energy of 12,558 ft-lbf … roughly five times the kinetic energy of a 308 Winchester rifle. Many people are taken in by the physical appearance of the size of the 50 BMG cartridge, which leads to dramatic overestimation of the terminal performance capability of this cartridge. A 50 BMG cartridge is a scaled-up 30-06 Springfield cartridge and has application in long-range shooting, anti-material targets (that don’t happen to have thick armor plating) and for penetration through common urban cover such as concrete and masonry walls. It must be mentioned that inaccuracy of a bullet increases with range. So even if your cartridge is capable of traveling the desired distance, dispersion of the round away from the point of aim will be greater as the distance becomes greater. This is because any force that causes a bullet to travel away from the centerline of the bore also creates a low velocity that works to push the bullet away from this centerline. The further you want to shoot, the better your marksmanship skills must be and the more consistent your equipment must be. I mentioned that the 50 BMG is useful against lightly armored and unarmored targets. A handful of politicians in the United States who pine for the restriction of these weapons to civilian ownership claim the 50 BMG has dramatic abilities to penetrate armor plating. Not surprisingly, these part-time law makers and full-time treasonists cite armored limousines and helicopters as being potential targets of these rifles. I have been in a helicopter twice and in an armored limousine a total of zero times. Maybe this type of politician is more worried about their safety than they are worried about our safety? There are two types of incapacitation against a vehicle: instantaneous and delayed. Instantaneous incapacitation means that the vehicle will be forced to stop before your position due to the damage received. An example of this would be a hit to the engine that binds or otherwise prevents the drivetrain from moving. Delayed incapacitation just means that your hit(s) will break the vehicle at some point after the tactical engagement or will necessitate repair to return the vehicle to full operational capability. 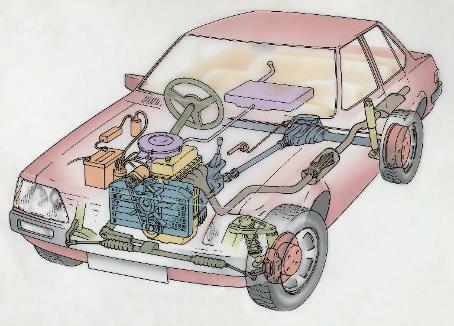 Systems causing delayed incapacitation when damaged include: the oil pump/pan, radiator, tires and battery. Nothing on a car is designed to take a hit from a bullet and still function but a cursory examination of cars in a developing country reveals the significant state of disrepair that a car can tolerate and still function. Notice the amount of the car above that is just sheet metal and airspace versus the size of the critical components. Many hits to a car will simply pass through the sheet metal (or the occupants) and have no effect on the movement of the vehicle itself. Here is where the design purpose of the incendiary and explosive projectiles have their nexus. Incendiary projectiles resemble weak explosives when they hit and do limited peripheral damage to the components located around the point of impact. They are moderately effective igniting fuel vapor … which is why in WW-II military aircraft began to be fitted with foam-filled, self-sealing tanks to counter this threat. Against a vehicle with no protective measures to reduce fuel vapor—look out. An absolutely fantastic cartridge, the Mk. 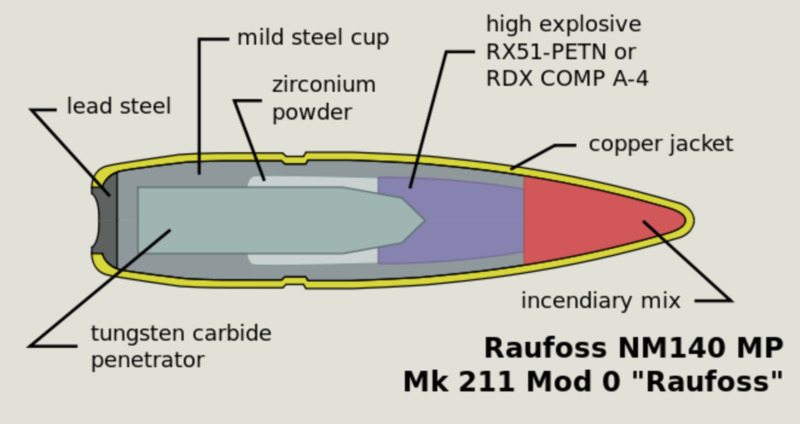 211 from NAAMO (Figure 1), is rightly called the ‘multipurpose round’ because it combines enhanced armor penetration capabilities with a smaller explosive charge and two incendiary compounds. It was the intent of the Norwegian armed forces to upgun the 50 BMGs that they owned, to have terminal performance similar to a standard 20mm cannon round. The incendiary compound in the front of the bullet initiates an explosive train inside of the bullet upon impact. This is then followed by a burster charge of plastic explosive which will propagate a shockwave at a much higher velocity than the bullet is traveling at—hopefully breaking apart a fuel-cell and aerosolizing some of the fuel from the fuel tank. The zirconium incendiary will then ignite this gas vapor and start a fire onboard. In case there is a critical area in the line of the bullet, the tungsten carbine penetrator core is about as good as it gets for hard target penetration. In terms of terminal performance against vehicles, the Mk 211 is likely as good as it gets. Shockingly, such rounds are not for sale to the general public in the United States or any other country that allows civilian gun ownership. The best that US gunowners can do is to purchase new military ammunition that failed lot inspection or buy military surplus ammunition that is no longer believed to meet military specifications. What this usually means is the M2, M17 or M33 ball round. The only armor piercing cartridges in the US inventory for the 50 BMG are the M2, M8, M20, SLAP and Mk.211. The other rounds may attract a magnet and may have steel cores but the steel core is likely mild steel and was placed there instead of lead due to wartime shortages (WWII) or for reasons of dynamic stability of the projectile. If you consider a firearm to be part of your personal safety plan, you must be certain of your capabilities and your weapons capabilities. This may mean getting out in the woods and lighting up a few discarded cars and washing machines. You must be certain of what your ammunition can do if you ever would consider using it for hunting or for self-defense. Just because some shifty-looking guy at the gun show is telling you that the M33 he’s selling is armor piercing, does not make it so. He’s interested in getting your money and you are interested in staying alive should things go south in a dramatic fashion one day. The only way to know what your ammunition can do is to shoot thick, hardened steel with the round out of your firearm. 0.75” thick RHA steel plate (AR-500 if you don’t have HHA or RHA on hand) is a good starting point because a 30-06 M2 round can penetrate 0.70” of RHA plate. Taking a plate that is 20mm thick and turning it at a 45 degree angle will increase its apparent thickness to 37mm. How is that for a cheap, lightweight way to increase your armor plate effectiveness? ), some armored fighting vehicles and some light tanks also fall into this category. The best a 50 BMG could do against a main battle tank is to attract the tanks full attention and maybe bust a spotlight lens or crew viewport in the process. It may appear that the vehicle is very vulnerable to small arms fire and is nothing more than a truck with a fancy camou paint job. 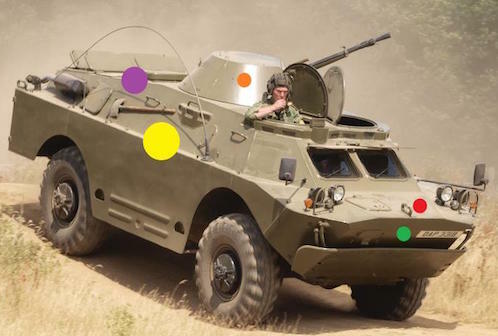 Nothing can be further from the truth as I present below with the different thicknesses of armor plating that can be encountered on the BRDM-2. The greatest problem with armor is that it is either heavy and ‘cheap’ (steel), thick and expensive (aluminum) or light and very expensive (engineered composites like Kevlar). 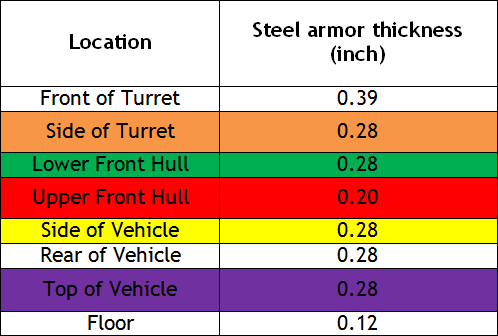 If the ammunition is not labeled from the factory as being ‘armor piercing’ then chances are it will have little or no effect against steel plate. 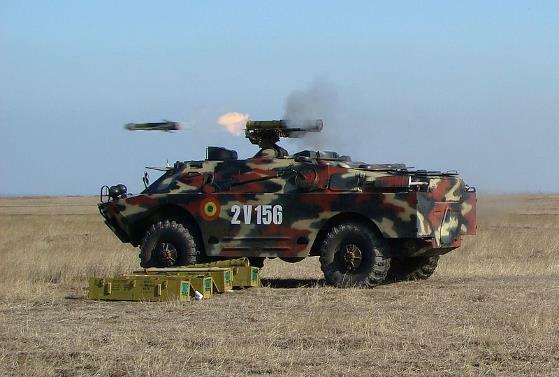 Another area where small arms are insufficient but the 50 BMG helps to bridge the performance gap, is the penetration of CMU blocks. Concrete blocks present a significant challenge to small arms projectile. Most small arms cannot penetrate a concrete wall as we will see on the video to the right. 50 BMG was not available during this test but since the 338 Winchester Magnum lead core went through both sides of the CMU and into the target boards, it is reasonable to suspect that 50 BMG would be considerably more effective. Ammunition selection for the 50 BMG is simple because it is such a powerful weapon. If you are shooting for precision, there are many fine bullets available such as the Hornady A-Max and Barnes Banded Solid. For general purpose shooting, the contract ‘overrun’ M33 ball is a good economical choice as is the decommissioned military surplus rounds. But I advise much caution in using military 50 BMG ammunition. You must be able to identify the round by headstamp and the color of the paint on the nose. Many of the cartridges contain tracer material which can start a fire and some contain incendiary material which will start a fire if there is any vegetation around. Ask me about the time when I worked for the US Army, on a Navy range and the only rounds available for sighting in the gun were Navy Mk. 211 rounds. Luckily, we had a steel plate to shoot to initiate the explosive train … unfortunately this was our only course of action (because delinking the M33 from the belts would have required a person certified in … delinking ammunition from a belt… which we did not have). So, sighting in the gun was accomplished. And so was setting over two acres of land on fire. Please be careful where you shoot your tracer and incendiary ammunition.